It may be the most beautiful spot on the Wright State University campus, but few people even know it’s there. It reveals itself only to those who wander down a shy, tree-lined gravel drive that seemingly goes nowhere. It leads to nearly two acres of restored prairie — a kaleidoscope of colorful wildflowers and dancing butterflies. A chorus of birds and insects. A dazzling display of nature. 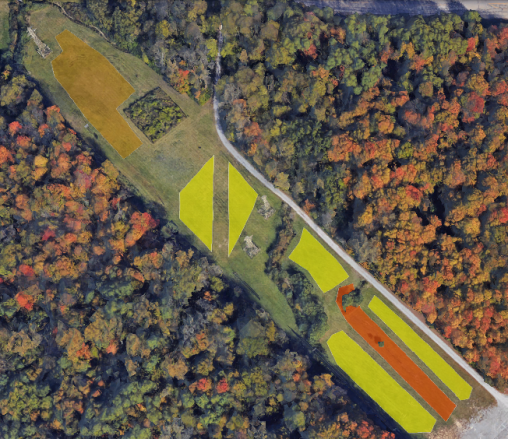 Three years in the making, the Wright State prairie is the work of the Department of Biological Sciences. Students and faculty members hand-tossed a strategic mix of seeds designed to create a palette of plants that would blossom at different times throughout the season as well as attract and nourish birds and insects. The prairie has become a colorful carpet underneath a line of power transmission towers that straddles the campus. The rectangular prairie runs northwest from the Wright State Nutter Center parking lots to University Drive next to the Mini University childcare center. The site, which was cleared of trees as part of the transmission line right-of-way, was originally planted with grass and mowed by grounds crews as necessary. “It didn’t provide the kind of ecosystem services that might have been reflected in this area in the past,” said Don Cipollini, who spearheaded the restoration. So three years ago, faculty and students in the department began restoring what might have been there a few hundred years ago, trying to bring back the habitat and ecosystem support for insects, birds and other pollinators that assist plants in their reproduction. 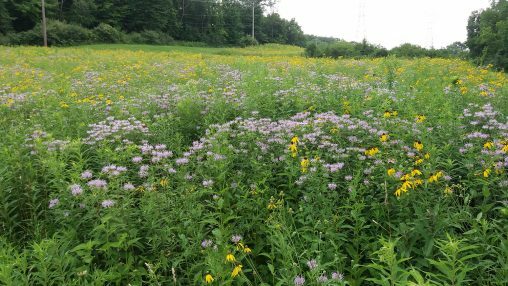 Prairie restoration has become fairly popular because of increasing concern about the loss of native habitats and declines in pollinators – birds and insects that assist plants in their reproduction. It’s easy to lose yourself in nature at the prairie. A sea of yellow and purple undulates in the breeze. Butterflies flutter and float over the flowers. Hummingbirds and dragonflies hover. Goldfinches arrow through the air, riding the currents. Bumblebees collect nectar. Caterpillars munch on leaves. There are grasshoppers and iridescent, green-shelled leaf beetles. Birds, crickets and katydids strike up a symphony. The first step in restoring the prairie was to kill the lawn grass with herbicide. After the grass was killed, Drew Sheaffer, who graduated with his master’s degree in 2016, helped acquire seed and prepare it for planting. Then John Stireman, professor of biological sciences, Cipollini and several students spread the seed by hand. The prairie has three different seed mixes. The pollinator mix produces a diverse array of flowers that bloom continuously throughout the year and are sources of nectar and of food for larvae. A second mix was spread in areas of rocky and drier soils, and a third mix was used in swale areas that are wetter. The idea was to have a variety of mixes that enhance the value of the entire prairie. Currently blooming are yellow prairie coneflowers and purple bergamos of the mint family, which perfume the air. Purple coneflowers, prairie grasses and prairie thistles will become more prominent as the season progresses. The prairie evolves, with species coming and going in their dominance. In two years, the prairie grasses — such as big bluestem grass, Indian grass and witch grass — will likely be more dominant. Plot map for the prairie. The prairie also attracts monarch butterflies. Thomas Rooney, professor of biological sciences, partnered with the U.S. Fish and Wildlife Service in a program to help restore the population of the monarch, a butterfly with distinctive orange and black markings that is drawn to milkweed. Milkweed seeds provided by the agency were germinated in Wright State’s greenhouse and produced nearly 5,000 seedlings. Most of the seedlings were given to homeowners around the state to restore the monarch habitat on their properties, but 300 of the seedlings were planted in the prairie. “Anywhere you put a patch of milkweeds, a monarch will find it,” said Cipollini. The prairie requires no fertilizer or weeding. The grounds crew mows down the prairie in early spring, before plants really start to grow. “If you didn’t do some type of management, you would have woody plants showing up — shrubs, honeysuckle,” said Cipollini. The prairie has become a wonderland for young children from nearby Mini University, who are shepherded through on walks and tours. Cipollini encourages the campus community and the public to come out and enjoy the prairie. Strips of mown grass strips make it easy to navigate. “It brings me a lot of pride to see this,” he said. Jeffrey Brown, who is pursuing his master’s degree in biology and is interested in beetles and flies, likes to spend time at the prairie. Brown, whose career goal is to work for a park service or forest services, suggests that visitors to the prairie spend enough time there to take it all in. Cipollini would like to convert other areas of campus to prairie habitats.